Low hanging fruit is tasty. It is actually tastier than the one hanging higher on the same tree. Fruits can grow on any branch of a tree. 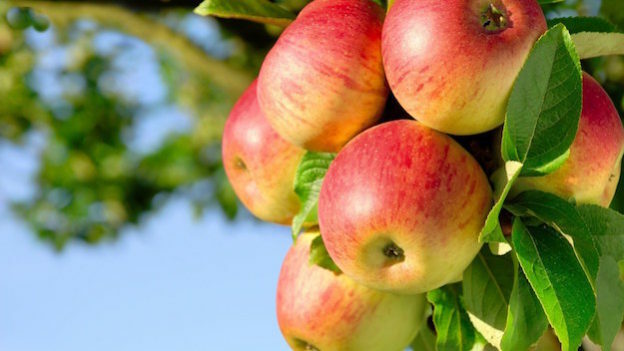 Usually, the fruit quality is distributed evenly all over a tree (e.g. : rambutan). However, based on the position or altitude of the fruits, some are easier to reach than others. This is because fruit tree can sometimes grow really tall like a skyscraper. Those within arm reach are easier to harvest than those hanging high at the top of the tree. Therefore, the cost of harvesting is higher for the higher hanging fruits. Not to mention that the risk of injury is also higher if there were accident when climbing the tree. When the fruit quality is about the same, I prefer the low hanging fruit over high hanging fruit. It is tastier because the effort spent in harvesting is lesser. When there are enough low hanging fruits, I can safely ignore the high hanging ones. Where you started matters. Some places will have more resources than others. For instance, some places have gold mines and some others have oil. Some are deserts. Initial condition even determines how successful a person can be. I read the following example from an article. Imagine two equally capable graduates looking to become a professor at a highly reputable university. However, the university only has one spot available. Since both graduates are equally qualified, one of them will be chosen while the other need to look else where for work (e.g. : at a lower rank university). The graduate who becomes a professor at the highly reputable university has greater access to resources: better students therefore lesser work at teaching, better tools and equipments for research therefore more productive and more academic papers are published and becomes more well-known in the academic circle. The other graduate who becomes a professor at a lower rank university need to work and teach harder since the university has looser criteria for selecting students. The professor is also less productive due to lack of resources and time for research. In the end, one professor is judged as extremely successful while the other not so due to the initial distribution. In a poker game, just like in the game of life, people are being dealt with different cards. Those cards determine the initial condition. Where the fruits are being distributed over a tree is the initial condition. Where you are located is also the initial condition. Different initial conditions put different people into power. CEO has great access to company’s resources and therefore power to change the environment the way she likes. No matter where you started, you can accumulate resources that are available to you by focusing on the low hanging fruits. You can collect as much low hanging fruits as possible that are accessible to you. By the time you accumulated enough resources, you can create your own luck. Having resources allows you to change your environment. In other words, the more resources you have, the luckier you get. I can even go as far as claiming that how much resources you have is a measure of how much luck you get. Luck is proportional to the amount of resources that you have. Low hanging fruit is luck in disguise. Something that you had tried very hard to obtain can cost a lot. Trying too hard is not the right thing to do given that you have limited resources. The point of low hanging fruit strategy is not to try too hard but to identify your low hanging fruit as not to waste it: the low hanging fruit that is available uniquely to you given your initial condition. Low hanging fruit is available for you and is what you can easily reach for. It is your advantage. It is what money cannot buy. It is your edge. Everyone is in his/her own unique position in space and time to exploit his/her low hanging fruit available to him/her. Harvesting low hanging fruits significantly reduces risk of failure. It is robust. It gives margin of safety as in providing high return with low risk. In computer science’s term, low hanging fruit has low computational cost. It is something that is easy to do. When there is too much to do, pick the easiest tasks with the highest payoff. Over time, you will accumulate much more resources this way. When you are a giant, you can easily walk over a 1-foot bar. You can even help others to cross the 1-foot bar. It is harder when you encounter a 7-foot bar. In this case, you need other giants to help. Everyone is unique and has different strength. Some might be a giant in one domain but weak in others as illustrated in table below. Do what you do best as you are already a giant in your domain. You can easily cross as many 1-foot bars as possible in your domains. The 1-foot bars are your low hanging fruits. Over time, you have gone a long way and collected more resources and you might be able to grow and become a giant in other domains. The condition will change, just as the initial condition changes at different point in time and space. Look for the obvious things. Things that are obvious to you may not be obvious to others. You can see opportunities where others don’t. Be the best in your domain is rewarding. In the stock market, whenever there is someone saying the market is overvalued, other will point out that he/she is still able to find undervalued stocks and profit from them. Exceptions are everywhere. Exceptions are part of our life. It is part of the rule. 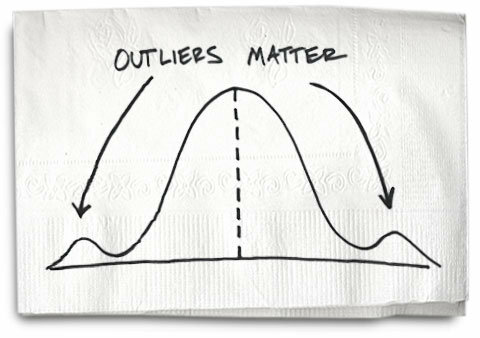 There will always be exceptions as there are outliers in a normal distribution. The market is big. You will get different conclusion based on how you approach your search and also based on your initial condition. Peter Lynch’s famous advice is to buy what you know. This can be translated into grab your low hanging fruit relative to you. Warren Buffett has been harvesting low hanging fruits for his lifetime with unbreakable investment record. Exceptions are low hanging fruits in disguise. Find your exceptions. Your initial condition may put you at exceptions. There will not be many exceptions. They will not be available all the time. But it is better to have one exceptionally good idea from time to time than to have 100 average ideas all at the same time. The former is much more enjoyable while the latter is overwhelming. That is the beauty of exceptions. That is why low hanging fruit is tastier. You will find something as long as you are searching. Low hanging fruits are everywhere. Exception is part of the rule. Whenever other says there is no hope, you know better. Explore and exploit low hanging fruits. It is your best bet. It provides a framework for optimal decision making for maximising the use of resources. The best thing in life is free. The second best thing is cheap. The worst thing is expensive. Low hanging fruit is cheap and sometimes it is free. Look for free things. Hunt for low hanging fruits. The world is your playground. This entry was posted in Investment and tagged Finance, Luck, Plant on May 8, 2017 by Chok Leong. Indeed we need to look for the low-hanging fruits. Wasting less resources and gaining much more in the process.